Was terribly sorry to hear about Mr Hatfield's heart attack, am sure you must have been quite worried for a while. However, am very pleased to know that the rest has done him a lot of good & he is in condition to return to work. The upset conditions these days is a great strain on us all & is basicly the cause of so much illness going around, it seems to effect everyone, regardless of age - no flatter what business you're in, its just a rat race - a survival of the fittest, which keeps you on edge, & nervous tension. Hope you have a good time at the Fair - I have'nt been to one in years, the last one I think was in Holland in 1911, I worked there with a troupe of acrobatic comedians, we were called the 8 KOMIKS, we got little money but had a barrel of fun - those were happy days. Well, think thats all for now. 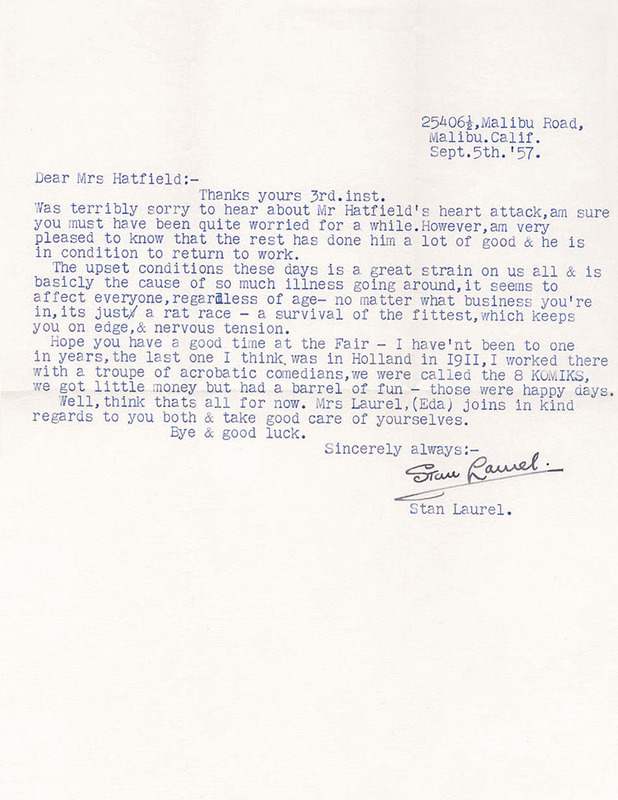 Mrs Laurel, (Eda) joins in kind regards to you both & take good care of yourselves. Thank you for your nice letter just recd. If your Father wishes to fly you out here, I shall indeed be pleased to see you, it will be my pleasure to meet you both. If you will kindly give me a call on arrival, I will give you directions on how to get out to my place. My phone number is:- Globe 68214. I am now living at the beach in MALIBU, its about 30 minutes drive from Santa Monica. My kind regards & best. Enclosed are the three stickers you requested. Will send the pictures when you let me know the names you want on them. You still have'nt explained what the trouble is about between you & Mr Mansker, I would like very much to get the matter straightened out to both of your satisfactions,so please let me know in your next letter whats on your mind. Glad the stamps were interesting to you, I get many requests for pictures from that section of the Globe, our old films are evidently quite popular with them. Have'nt had a chance to read the book yet, the mail is still coming in & it getting to be a big chore answering them all, I imagine around two thousand to date, I could really use a secretary to help me take care of it all, it gets very tiring at times so I generally take a day or so rest from it occasionally & store up some energy. I never knew of the Sherlock Holmes Society in London & do'nt know any of those connected with it, it sounds like it could be very interesting checking over the old familiar spots. I have driven down Baker Street, but frankly did'nt pay much attention to it. The Wax Museum you mention is the famous Madame Tassauds, thats really a remarkable place to visit,the replicas of all the famous persons are weirdly life like & wearing the actual costumes worn by them, you have a feeling they are still living & are about to say something to you - it kind of gives you the creeps. Babe & I were taken there in '47 & photographed with a lot of the figures for publicity purpose. No, I was never in the Abbey - never had much time to see the big places of interest, I was either working or looking for it.! About the recorder, the tape can be used over & over again, so very economical in that dept. If a recording was made on this machine, you would have to play it back seperately with your silent picture, synchronized. I believe there is a type of film made with this kind of tape attached but you have to have a special projector to run it - just how it works I do'nt know, last year a couple of Kids from New Jersey made a short film imitating L&H, & it was made in sound on this tape type film, but it did'nt work on my machine (the sound). Note Bob Hope was at the York Fair, he's sure a busy guy, I think he's crazy to work so hard, he has all the Glory & Money, what else does he expect or want. Many of the star performers suffer the 'butterflies', more than the lesser ones - Al Jolson really used to have the jitters before he went on, he was very sensitive,I think it's the strain of responsibility that causes it & the intense desire to make good in front of all the people that have paid big prices to see you, its a sickly feeling if you do'nt happen to appeal to that particular crowd of the 'make me laugh' type. I've experienced that many times. The LimeHouse district I think is the East Side of London, have never been there, I understand its a tough Slum neighbourhood, I think your Sherlock Holmes Society would be able to give you a better description of it with historical facts. The salt air here does'nt seem to have any effect on the food, (bread etc). & so far no sense of dampness, but it does effect some metals, like the chrome work on the car for instance. Have no idea what became or Diana Durbin, probably married & retired. Am certainly pleased to know that business is good again,that must be a great relief after such a slow sumner - do you have a Soda Fountain in the store?. That 'Little Rock' situation is shocking, I think its disgraceful. Gov. Faubus was very foolish to call out the Guards - everything would have been Ok otherwise, he sure stirred up a lot of trouble for no reason at all, just revived a sore spot. Note 'Cindy' is now walking - now your troubles start! she'll be into everyth1ng, bless her heart. All for now Earl. Mrs L joins in regards & best to you all. Thank you for your nice letter of Aug.8th. I deeply appreciated your kind expression of sympathy over the death of my dear friend & partner Oliver. It was indeed a great loss - I shall muss him terribly after the many years of happy association. I remember very well your photographing us at the Palace Hotel during our visit to Southend - a happy memory. It was certainly nice of you to drop a line, I greatly value your friendly interest. Bill Jacobs was the resident photographer at the Palace Hotel in Southend on Sea, where Stan and Babe stayed aduring their appearance at the local Odeon in 1952. Five years later, after Oliver Hardy passed away, Bill wrote to Stan and received this letter. The passing of my dear friend and partner was indeed a sad loss. I shall miss him terribly after the many years of happy association. Thank you for your nice letter of 15th.inst. I appreciated very much your kind expression & sentiment. The passing of my dear friend & partner was indeed a sad loss. I shall miss him terribly after the many years of happy association. My deep thanks for your kindly interest Mr Durden. Regards & best wishes always. Am enclosing you a little picture - thought you might like to have it as a souvenir of many happy memories.